The Vancouver Condo Buzz » Only 83 Available! Live at CANVAS Surrey Townhomes in Panorama District from $326,900! Floor Plans range between 1,440 to 1,706 square feet! « From $559k! East Maple Ridge WynnRidge Single Family Detached Homes for Sale by Falcon/Genstar Developers > 3 & 4 Bedroom Homes with Master on Main Floor Plans Available! Only 83 Available! Live at CANVAS Surrey Townhomes in Panorama District from $326,900! Floor Plans range between 1,440 to 1,706 square feet! Brought to you by Garcha Properties Ltd., the new Canvas Surrey townhome project is now accepting priority registrations and getting ready for an early Summer 2013 release. The new collection of Surrey Canvas Townhouses features an enviable location at 142nd Street and 64th Avenue Surrey BC where you will find three bedroom floor plans that offer between 1,450 to over 1,700 square feet of living space (approximate). This family oriented, low maintenance and multi-level experience will also feature a Canvas Surrey townhome community amenity centre/clubhouse that is called the Canvas Club. This stand alone structure will feature lots of amenities for residents at the new Canvas Surrey townhouse community. In addition, the townhomes will be situated very close to two elementary schools (one French) in addition to the Bell Centre for Performing Arts, big box retail shops and great outdoor recreational options. More information is coming online at www.liveatcanvas.com very soon. Make it yours! Book your VIP appointment today and get in early for the best selection! Customize your new Surrey Canvas Townhome today with the option of choosing one of four on trend paint colours selected to complement the designer finishes of these beautifully tailored homes. Canvas Surrey townhomes for sale offers a collection of central and spacious three bedroom townhouses with over 1,440 square feet of modern living space. Featuring main floor powder rooms, generous amounts of storage space, luxurious ensuite bathrooms and even side-by-side double car garages, you can’t beat the incredible value at the new Surrey Canvast Townhomes by Garcha Properties Ltd. Relax and rejuvenate at the 2,600 square foot Clubhouse at Canvas Townhomes too! The perfect place for family gatherings and entertaining friends is right here. Coming soon to the Panorama Surrey real estate district at 142 Street & 64 Avenue Surrey BC. In addition, presale pricing at the Canvas Surrey townhouses starts from just $326,900 for a limited time offer only! Starting from the $300’s. Spacious 3 bedroom townhouses is coming to Canvas in Panorama Surrey! Life is your canvas. Choose what you love and live your life in full colour! A fine collection of Surrey Canvas townhouse floor plans is now available. Plan A is a 3 bedroom and 2.5 bathroom townhome between 1462 to 1473 square feet over 3 levels with a double tandem garage. Beautiful gally style kitchen with a tall pantry are key highlights of floor plan A at Canvas Surrey. In addition, this layout features a family room off the kitchen plus an open great room. The added bonus of a powder room on the main floor is very convenient and perfect for entertaining. Floorplan B at Canvas Living also features 3 beds and 2.5 baths and is between 1,503 to 1,533 square feet in size. It too has 3 levels with a very spacious tandem double garage. The Panorama Surrey Canvas townhouse floor plan D is by far the most spacious with 1,689 to 1,706 square feet. This executive Surrey townhome features a huge central island in the kitchen with a large pantry as well. There’s also a large family room, large great room and a main floor powder room like the other layouts. The spa inspired master ensuite has a walk in robe and the bedroom level also houses the laundry (very convenient). 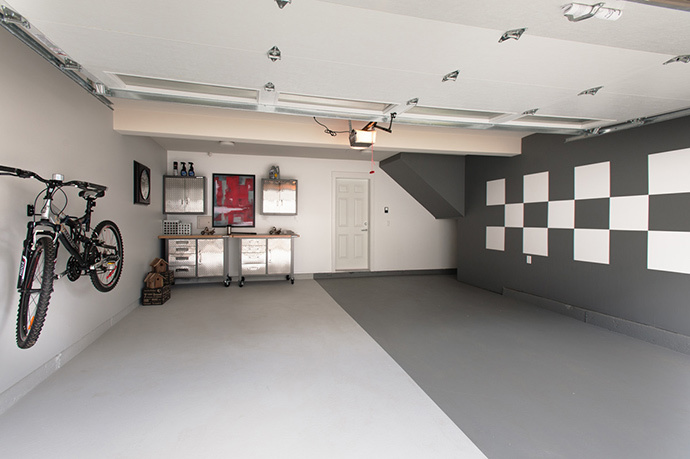 There’s a recreation room down below in addition to a side by side double garage. Please note that all interior finishes stated in this article are subject to change at any time. Please consult your agent or visit a sales rep for details. 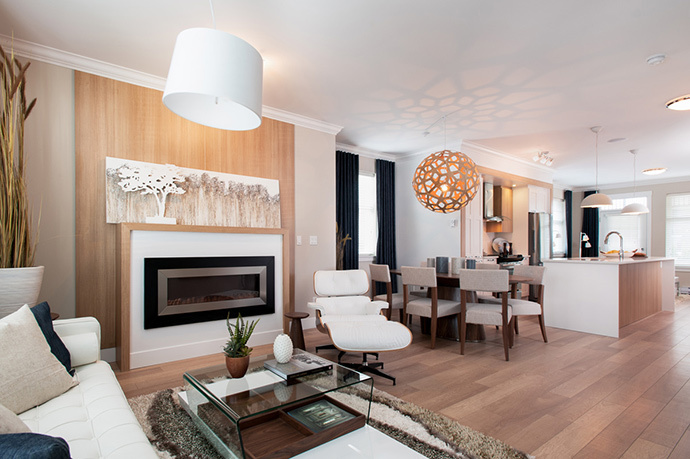 The beautiful interiors at the new Surrey Canvas Townhouses include 2 designer colour palettes designed by Giraffe Design. The homes will have Rich Toryls laminate hardwood floors in tones of Cobblestone or Barley in addition to airy nine foot ceilings and plush wall to wall carpets in the bedrooms. The Panorama Surrey Canvas townhomes will also feature expansive low emission glass, two inch horizontal blinds, inviting patios/decks and stacked Whirlpool washer/dryer. In addition, all floor plans will have main floor powder rooms. The beautiful bathrooms at the Canvas Surrey townhouse project includes large format porcelain tiled floors, under mount sinks, bevelled mirror with pendant lighting, marble counters, flat panel and sleek cabinets as well as a soaker tub and five foot glass enclosed showers with oversized shower heads. The kitchens at Canvas Surrey Panorama townhomes for sale will feature a sleek stainless steel appliance set by Samsung and Whirlpool in addition to a polished chrome faucet, large under mount single compartment sink (stainless steel) with disposal unit in addition to stone slab counters, large format tiled backsplash and contemporary flat paneled cabinetry. All homes will have expansive Hardie Plank siding, rainscreen technology, 2×6 inch exterior wall construction, double 2×4 inch insulated party wall system, in home smoke detectors that are hard wired, rough in for central vacuum system as well as the premium warranty by Pacific Home Warranty. Residents at Canvas Living will be spoiled with great on site amenities at The Club at Canvas. Relax and rejuvenate at the 2,600 square foot Clubhouse at Canvas Town Homes where you will find an inspiring fitness centre with a separate yoga/pilates studio in addition to a multi-media theatre screening room. There’s even a chef inspired kitchen overlooking a fireside lounge and outdoor patio which is great for gatherings. The Club at Canvas Surrey town homes will also come with over 4,500 square feet of dedicated outdoor amenity space for your enjoyment year round. Canvas Surrey Panorama townhomes offer only 83 luxuriously designed and finished townhouses located at 6350 – 142nd Street Surrey BC. Priced from the low $300’s, the Canvas Surrey presale townhomes feature 3 bedroom floor plans that range in size between 1,440 to 1,706 square feet! Most of the floor plans at Surrey Canvas townhomes present side-by-side double car garages and the public grand opening is expected to be early June 2013. However, there is special VIP priority previews on right now. Both bright and beautiful, the homes at Canvas Surrey Panorama are clean, simple, elegant yet contemporary. As the name suggests, the homes start off as a blank canvas for home buyers to customize based on their likes, lifestyle and more. 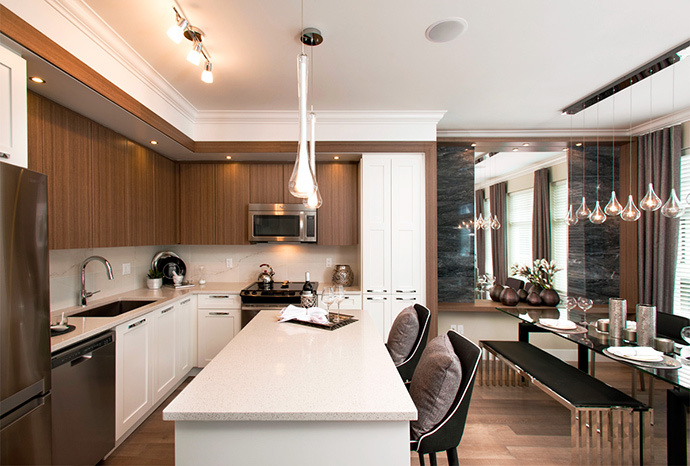 The state of the art palettes and finishes are superior to other projects in the Panorama Surrey real estate district and not only that, some of the finishes are comparable to things that you would find in multi-million dollar homes. Things like curved glass hood fans that float above the range and double door fridges are standard at the new Surrey Canvas townhome project. Other features include wide accent strips that frame the entire cabinet and counter area. The central island has enough space for up to 6 people in certain floor plans and the set of kitchen appliances are all high-end and contemporary. 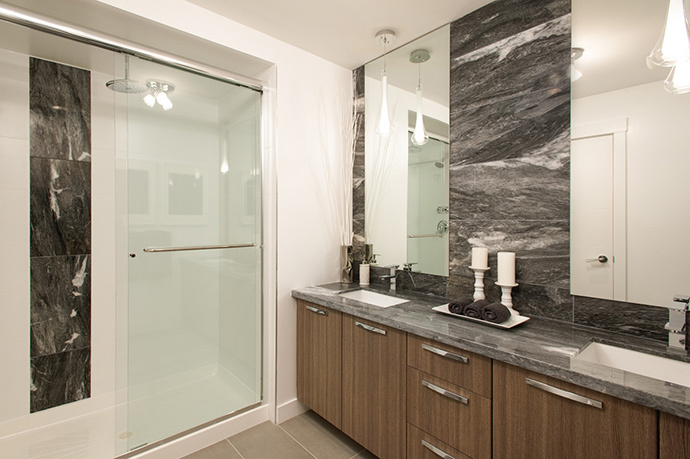 Beautiful ensuite bathrooms grace every new Canvas Surrey townhome for sale as well. From art niches to marble bathroom counters and from dramatic full height mirrors to walk in closets in the masters, every detail has been thought about when these homes were being designed. In addition, the presale Surrey Canvas townhomes will feature things like oversized rooms, closet organizers, premium flooring and large windows for lots of natural light. Stay tuned for the grand opening coming soon!